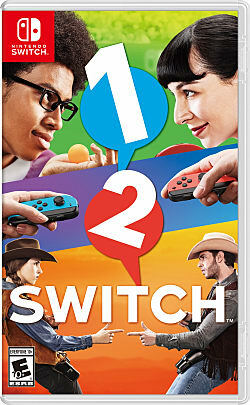 1-2 Switch is a party game consisting of several mini-games made with the unique intention of not looking at a screen while playing, but instead at your opponent. Each of these mini-games shows off the unique features found in the Swtich's JoyCon controllers, such as the IR camera, motion sensors, and what Nintendo is calling "HD Rumble" for object and depth recognition. Some of these mini-games include an eating contest, a western-style quick draw, and swinging or catching a samurai sword. Fun games for the whole family are here for the Nintendo Switch. If you're looking for the best kids' games on the Nintendo Switch, look no further. Here is our top 5. The Nintendo Switch launched yesterday with a small, but varied lineup to get players situated with their new system. We list what they are and how much they'll be. It's expensive, it has few games, and there are a few teething issues. But you need one. Here's how to convince your folks. No one has reviewed 1-2 Switch yet! Played 1-2 Switch yet? What did you think?